One of the key aims of MMO Freelance is to help our freelance members connect with each other. Through freelance events, guest blogs and personal introductions, we’re hoping to create a freelance network that is better connected and hopefully able to lend a helping hand to each other through project leads, introductions, or just a Friday beer. 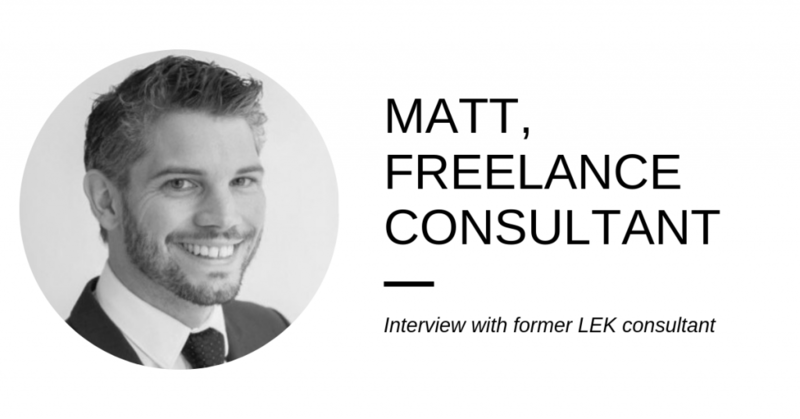 Here’s a guest blog from one of our freelance members – Matt, a former LEK Consultant. Why did you decide to become a freelance consultant? After working at LEK for more than 3 years, and spreading my time out across multiple offices and continents, I decided that it was time to get some new experiences outside the institutional consulting bubble. Although I hadn’t found a full-time role I was interested in committing to, I felt like the time was right to make a move. Freelancing seemed to be the sensible middle ground. It offered maximal flexibility, good money, and it gave me the luxury of time to decide the direction I wanted to go in. How easy it was to make the move from full time to freelance. There are so many people who have done it before that are willing to give you guidance and there are many organisations out there to make your move easy and smooth. Movemeon was an incredible resource while I was making the transition, it gave me the confidence of knowing that there was ample work out there that would actually interest me. What one thing would you really want to know? How easy it is to make the move, and to escape the treadmill of a large consulting firm. I remember feeling the typical angst you associate with stepping into the unknown and leaving without another ‘real’ job. It seemed like a common story, being ready to move on but being afraid to take a leap of faith unless conditions were perfect. So just do it, if you are ready to leave, just leave. Take a break, pick up a few months of freelance work while you get some perspective on what you really want. You can always go back to full time consulting if things don’t work out in a way that sits right with you. It’s important to remember that you spend a majority of your time in the workplace and if you need a change, for whatever reason, it’s down to you to make it happen. Freelancing may seem daunting at first but with all the resources out there at your disposal, like movemeon, it’s really not as scary as you think. Why did you go back to perm? The right full-time role came around in a small healthcare company that I couldn’t turn down. It was offering me the opportunity to utilise the expertise I gained from my first career as a doctor with the skills I had learnt from consulting. If this specific role hadn’t come around, I think I would still be happily freelancing.